Whenever the name “Escher” is mentioned, the first thing that springs to mind is optical illusion. 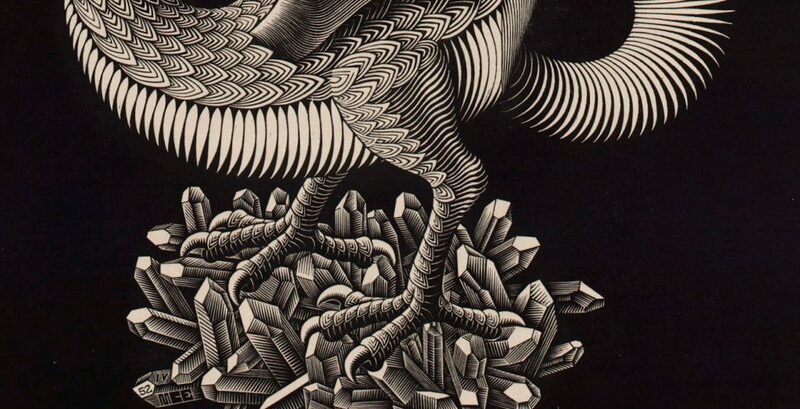 We have lost count of the number of visitors who have said to us: “As a teenager, I used to spend hours staring at those Escher prints in an effort to work out HOW he fooled me.” The visual tricks that he played on us continue to amaze us to this day. Over the past few years, I have sought to describe the most famous prints in my “Eschers of the Month”, such as physical impossibility in Still Life with Mirror, or in Waterfall; the unnoticeable transitions in the three Metamorphoses; or the apparent logic in the print Horsemen where, as in Day and Night, we struggle to distinguish between the foreground and background because our eyes are only capable of observing either the foreground or the background. When we dissect these works of art, we see either red or grey horsemen and in Day and Night we see mainly white birds – it is only later that we notice the black birds. 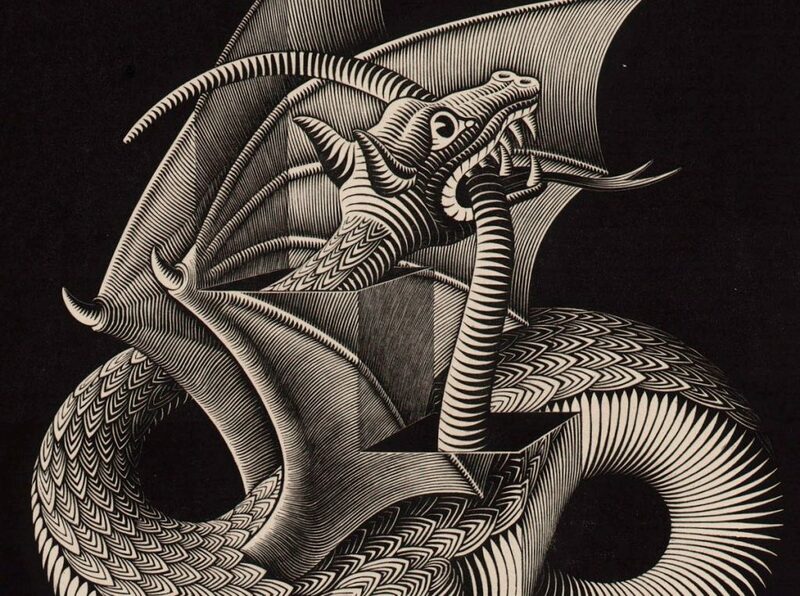 In Dragon, Escher adopts a more traditional approach to the optical illusion. The subject matter is fictional: dragons appear in fairy tales, myths, legends and games, not in our everyday existence. So when you see this beast, you know that Escher has let his imagination run wild. And yet, although we are aware of this, he still manages to amaze us. He wants to lead us up the proverbial garden path across the flatness of the paper. On paper, he creates a three-dimensional illusion. After all, you can’t walk around a drawing of a tree. And so our dragon is also flat. At the same time, Escher deploys all his masterly skills to make you believe that this animal is ‘real’. When we examine the stomach and legs, we can clearly see what tricks he deploys for this purpose: the hind leg is higher than the front leg. He applies shade to the back of the legs, which runs all the way from the front leg across the thigh. This scaly dragon has a kind of spherical snake-like structure which Escher works out according to the rules of one-point perspective. So far, this is a classic way of depicting a dragon. But what does Escher do with the head and the tail? He has created an optical slit or cut in his own wood engraving. To convey this clearly, the cut is enlarged in the viewer’s direction. So it appears as though slots have been created in the print itself, through which the dragon – the subject matter – passes his neck and tail! That way, an impossible circular movement emerges: the drawn dragon passes his head through his paper body, so that the head no longer appears to be drawn…. This is a textbook example of an optical illusion. Firstly, the subject matter does not exist in real life and secondly this mythical creature does impossible things! An alternative word for optical illusion that is often coined by art historians is the French term trompe-l’oeil. Literally translated, this means trick of the eye, or deception, one of Escher’s favourite occupations. In Dragon we are well and truly deceived, in a way that we don’t even notice at first. What is actually the difference between an optical illusion and a one-point perspective drawing that is carried out to its extremes? 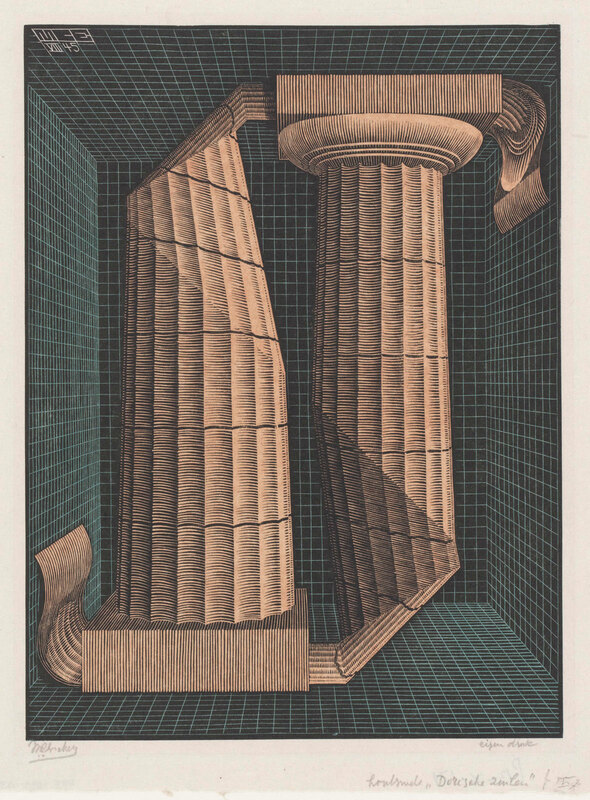 Let’s take two examples of wood engravings dating from 1945: Doric Columns and Three Spheres. Both works of art seem to be technical exercises, but there is one key difference. With Doric Columns you can almost instantly tell that they are not correct, or in any case that something is not ‘quite right’. As with Dragon, Escher plays a similarly bizarre game with our expectations, our perceptions and the moment of recognition. The two columns cast a strange shadow. On the little sign next to the work we can see the words ‘Doric Columns’. For some, that title conjures up certain associations: “oh yes, these columns are found in ancient Greek temples. They have no decoration at all on the top (the capital) and their long vertical ribs are an optical illusion.” That may well be our initial reaction. If we take a second look at the print we can see that this in fact incorrect. “folded in two halves: a vertical piece and a horizontal piece, on top of which the top sphere rests. But the disk can also be depicted like a round table top, at the bottom of the print, without a fold.”*. The middle and the bottom depictions need some explanation in order to recognise them as spheres. 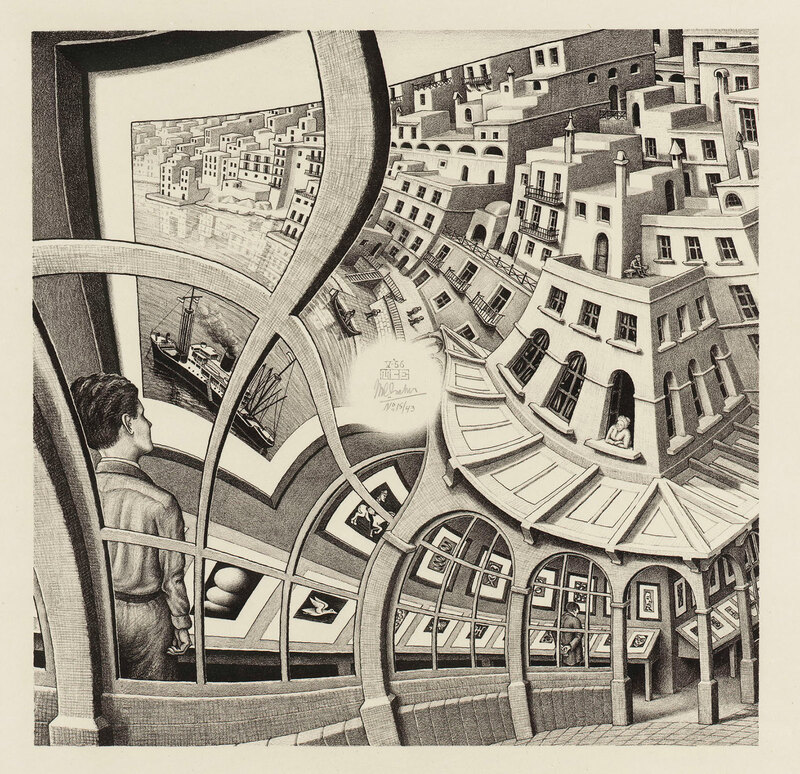 In July 1945, Escher created the lithograph Balcony, i.e. before he made Three Spheres in September. He applies a strange spherical bulge to a row of houses, at a time when the fish eye lens was not widely known. However, the optical illusion that he applies almost ten years later in Print Gallery seems far more complicated. 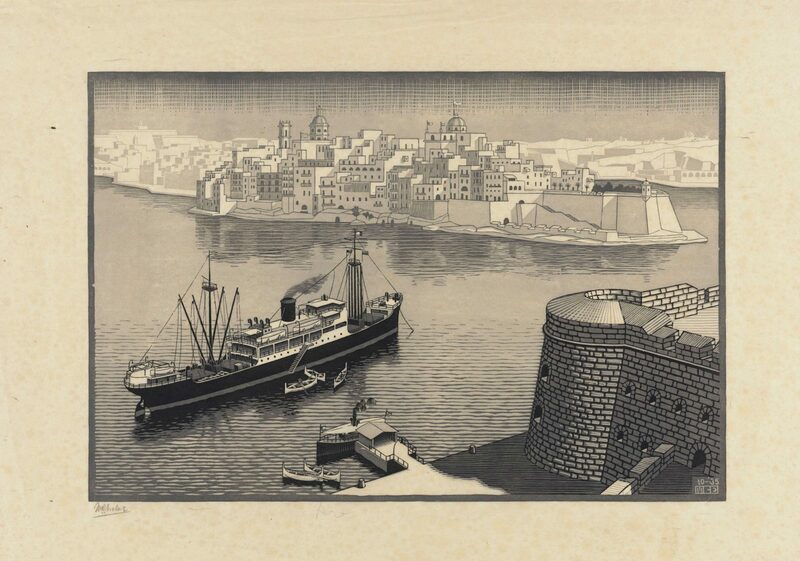 If we take the viewer of the art exhibition as our starting point, we look with him from the outside in, into the exhibition space to the work of art that bears a striking resemblance to Senglea. The optical illusion of Doric Columns (1945) is the theme that connects Print Gallery (1956) with Dragon (1952). 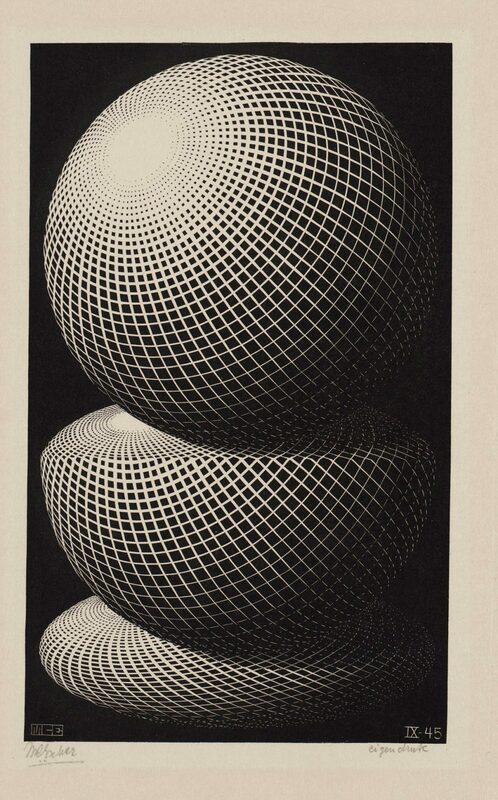 In 1959, Escher created Sphere Spirals. In his inimitably refined way, he once again reminds us of the stark contrast between looking at and seeing something. We see a sphere, but we are looking at a flat piece of paper! As is often the case, it is possible to group an Escher print into various categories. Escher classed Sphere Spirals in the group of spiralling bands and rinds. I also believe that this is the last print in the series to depict the conflict between flat and spatial objects. Sphere Spirals is the ideal optical illusion. The sphere is so beautiful because the spiralling band is golden yellow on the outside and red on the inside. That combination of colours stimulates our sense of reality. It is as though we are looking at a brittle glass sphere around which the bi-coloured spiral is wrapped. But beware: it is a woodcut! All these beautiful details have been cut by hand and applied to paper in different print runs! Truth be told, such a perfect sphere actually impresses me more than the little dragon that passes his head through his paper body. * 2006 Reprint, published by Taschen GMBH of “M.C. Escher Grafiek en Tekeningen; ingeleid en toegelicht door de graficus; originally published by Koninklijke uitgeverij J.J.Tijl NV Zwolle; 1959, all quotations are on p15.